SQL Server 2008 represents a sizable jump forward in scalability, performance, and usability for the DBA, developer, and business intelligence (BI) developer. It is no longer unheard of to have 20-terabyte databases running on a SQL Server. SQL Server administration used to just be the job of a database administrator (DBA), but as SQL Server proliferates throughout smaller companies, many developers have begun to act as administrators as well. Additionally, some of the new features in SQL Server are more developer-centric, and poor configuration of these features can result in poor performance. SQL Server now enables you to manage the policies on hundreds of SQL Servers in your environment as if you were managing a single instance. We've provided a comprehensive, tutorial-based book to get you over the learning curve of how to configure and administer SQL Server 2008. Whether you're an administrator or developer using SQL Server, you can't avoid wearing a DBA hat at some point. Developers often have SQL Server on their own workstations and must provide guidance to the administrator about how they'd like the production configured. Oftentimes, they're responsible for creating the database tables and indexes. Administrators or DBAs support the production servers and often inherit the database from the developer. 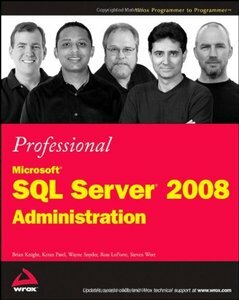 This book is intended for developers, DBAs, and casual users who hope to administer or may already be administering a SQL Server 2008 system and its business intelligence features, such as Integration Services. This book is a professional book, meaning the authors assume that you know the basics about how to query a SQL Server and have some rudimentary concepts of SQL Server already. For example, this book does not show you how to create a database or walk you through the installation of SQL Server using the wizard. Instead, the author of the installation chapter may provide insight into how to use some of the more advanced concepts of the installation. Although this book does not cover how to query a SQL Server database, it does cover how to tune the queries you've already written.